For my post this month I thought I’d share some pictures* of that most British of pastimes, the New Year Hunt. Traditionally, the hunting season runs from November to April, with Boxing Day or New Year being one of the calendar highlights. Fox hunting has been illegal in the UK (but not in Northern Ireland) since an Act of Parliament in 2004. The Act has been hotly protested by the pro-hunt lobby—indeed, Otis Ferry, son of the Roxy Music singer Bryan Ferry, wrote an article in the Sunday Times on the subject last week, while the anti-hunt lobby claims that, since the ban, more foxes are slaughtered by illegal hunting than ever before. Hunts now follow a false scent trail (called drag hunting) and are (meant to be) strictly monitored. While I love foxes, I also love tradition, so for me at least it’s wonderful to be able to see a hunt, even a false one. 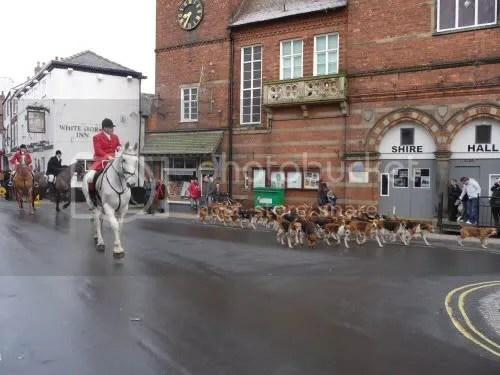 The arrival of the hounds, accompanied by the Whipper-In (on the white horse) and the Master of the Hounds (red coat, brown horse).